2018 Gerald Wilson Award: Ethan Moffitt, Window Wonders "Window Wonders" was performed by the Next Generation Jazz Orchestra at the 61st Annual Monterey Jazz Festival on September 23, 2018. Photo ©Monterey Jazz Festival / David Royal. Each year since 2005 at Monterey Jazz Festival's Next Generation Jazz Festival, the Big Band Composition Competition is open to student composers currently enrolled in high school. Compositions are judged by college-level music faculty, and the winning composer receives the Gerald Wilson Award, named in honor of the late legendary composer, arranger and trumpeter who was a friend of Monterey Jazz Festival for many years. The winning composition is performed on the Jimmy Lyons Stage in the Arena at the annual Monterey Jazz Festival by the Festival's all-star student band, the Next Generation Jazz Orchestra, and the student composer is given the Gerald Wilson Award and a cash prize. Bassist Ethan Moffitt, 18, is from Glendale, Calif. He currently studies double bass with David Moore and Composition with Andrew Norman at the University of Southern California. Ethan has been recognized with multiple honors for his performances, compositions, and arrangements. He was the recipient of a Merit Award on jazz bass in the 2017 National YoungArts Competition and a 2018 YoungArts Finalist in Jazz Bass. Ethan is the 2018 first prize winner of the Herb Pomeroy Jazz Composition and Arranging Contest for his original composition for big band Window Wonders. 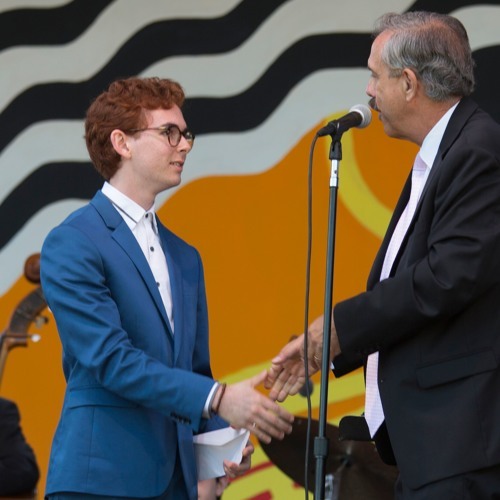 Ethan won first prize in both the 2017 Herb Pomeroy Jazz Composition and Arranging Contest, sponsored by the Berklee College of Music's Jazz Composition Department and Professional Writing Division, and the Dr. J. Douglas White Essentially Ellington Student Composition/Arranging Contest for his Big Band arrangement of Chick Corea's Humpty Dumpty. The Colburn Jazz Workshop's Big Band premiered the work at their winter concert in January 2017, was performed by the Berklee Concert Jazz Orchestra at the Hynes Convention Center in Boston, Mass, and was recorded by the Jazz at Lincoln Center Orchestra in New York, under the direction of Wynton Marsalis. Ethan was the recipient of the Herb Pomeroy Competition's third prize in 2016, for his original Big Band composition Cross Streets. Cross Streets was also a winner in the high school division of the 6th Annual Ithaca College Jazz Ensemble Composition Competition. Ethan was the recipient of several awards in the 2015, 2016 and 2017 DownBeat Magazine Student Music Awards, which are considered among the most prestigious honors in jazz education. Ethan won Outstanding Performance for a Jazz Soloist, Outstanding Original Composition for a Small Ensemble, Outstanding Composition for a Large Ensemble, and Best Jazz Arrangement. Ethan also won the 2017 Monterey Next Generation Jazz Soloist Award. Ethan's composition Ode für Streichorchester was premiered by the Colburn Chamber Orchestra in May 2016 and was performed by the Colburn Youth Orchestra on their inaugural European tour in the summer of 2016, performing in Prague, Austria, Salzburg, and Munich. Most recently, Ethan was selected as the 2018 winner of the Van Alexander Jazz Composing and Arranging Competition sponsored by the American Society of Musicians, Arrangers and Composers (ASMAC) for his composition for large jazz ensemble Window Wonders. He has won Monterey Jazz Festival’s Gerald Wilson Award for the same piece.